The global recruiting industry never stops. From the outside, recruiting talent to a company may look simple: you post an open job, wait for candidates to apply, and pick the one you think to be the best fit. But any HR professional knows that to hire talent that will benefit your company and help it get ahead, recruiting is much more complicated than that. 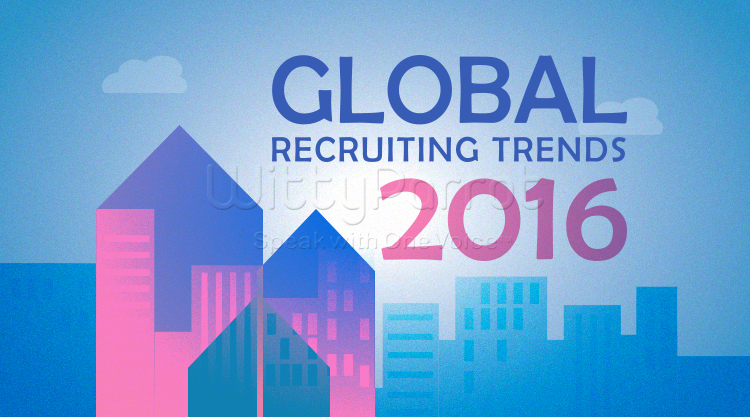 For that reason, the social media network LinkedIn has compiled a research survey on the most important recruiting trends of 2016. Here are our top 4 takeaways from the study, along with suggestions on how your business can keep up. Without a doubt, and understandably so, the quality of a hire remains by far the most important KPI for global recruiters. But how do you measure that quality? Many talent leaders face that question, as only 33% of respondents felt that their measuring of hiring quality is as good as it could be. Diving deeper into the survey, new hire performance evaluations seem to be the most successful metric to evaluate this KPI, according to no less than 50% of hires. But as the Society of Human Resource Managers points out, this performance evaluation can only be effective if the recruiter has measured and established the pre-hire quality of the position. Without this important benchmark, measuring the quality of a hire after it is complete will remain a challenge. Candidates are more likely to listen to their own network and their friends. Our employees are the ones who can most accurately vouch for what it’s like to work here. Employee referrals get us a lot further in the conversation than we otherwise would have. Encouraging employee referrals does not have to be difficult. Making your employees feel included in the process, and allowing time for referrals before making the position public, are crucial starting steps. If your organization is responsive to suggestions from its employees, even going as far as interviewing employees about the referred candidates, you can take advantage of this growing trend. Increasingly, employers are also beginning to realize the value and importance of marketing themselves to prospective applicants. Getting the best recruits means having to compete with other businesses in your industry for their services, establishing yourself as an employer of choice in the process. Recruiters are increasingly realizing this importance as 62% of respondents called creating and maintaining an employer brand a top organizational priority. How do you establish an employer brand? You may want to ask experts in your very organization. Your marketing department knows all about branding, and should be a close partner in this endeavor. Using channels like social media, professional networks, and the website, the most successful recruiters strategically build their brand in cooperation with marketing. Employee retention is continues to be a major concern for talent leaders across industries. No less than 32% of respondents to LinkedIn’s survey see it as their top organization priority for their coming year, realizing that hiring top talent means little if that talent does not stay and help the company long-term. And yet, many companies still don’t take advantage of a hiring strategy closely connected to retention: internal recruiting. Most recruiters still don’t have defined programs in place to help employees advance their careers internally, which tends to result in a significant retention boost. The solution is simple: to ensure you retain your employees at a desirable rate, focus attention and resources on internal recruiting as a solution. Of course, LinkedIn’s survey is just one of the many pieces of evidence pointing to the fact that these will be major global recruiting trends in 2016. Topics like employer brand, employee referrals, and internal recruiting have entered and will remain a part of the recruiting conversation, this year and beyond. To make sure you continue to recruit the best available talent, paying attention and reacting to these trends is a crucial first step. To leverage your recruiters and employees’ personal networks to reach potential candidates faster, watch this video on how WittyParrot can help.